The Academy has a need for a variety of volunteers during the corps’ 2017 tour. The Battalion still has open color guard spots. Prospective members should request audition info and plan on attending the corps’ callback audition camp April 28-29. Blue Devils, Blue Devils B, and Blue Devils C will all be performing at the organization’s “Sneak Peek” event on June 3 at the Concord Pavilion in California. Blue Knights is looking to hire a merchandise manager and merchandise assistant for the corps’ national summer tour. A well-known color guard soloist for Carolina Crown a few years back is now the Boston Crusaders’ color guard caption head. The Marching Roundtable podcast catches up with Herbert Washington to find out what he’s been up to since his performing days. The Cadets are looking to hire a transportation manager to help get the corps down the road this summer. There are still a few openings in Carolina Crown’s 2017 color guard section, with final auditions to be held soon. Props from the Cavaliers’ popular “Propaganda” show are for sale, and would make either a great memento for fans or good props for a marching band. Colt Cadets will be back in action for a rehearsal in Dubuque, Iowa on April 2. The Colts organization has moved into its new warehouse. Check out a view of the corps’ impressive new digs. You can help Crossmen qualify for up to $25,000 as part of the FedEx Small Business Grant Contest. Genesis is on the way to raising $30,000 in the quest to replace the corps’ 20-year-old mobile kitchen. See how you can help the corps achieve this goal. Guardians is looking for an athletic trainer to work with the corps during its summer season. On April 22, Pacific Crest will be holding its first-ever color guard audition event on the east coast, to be held at Byrnes High School in Duncan, South Carolina. 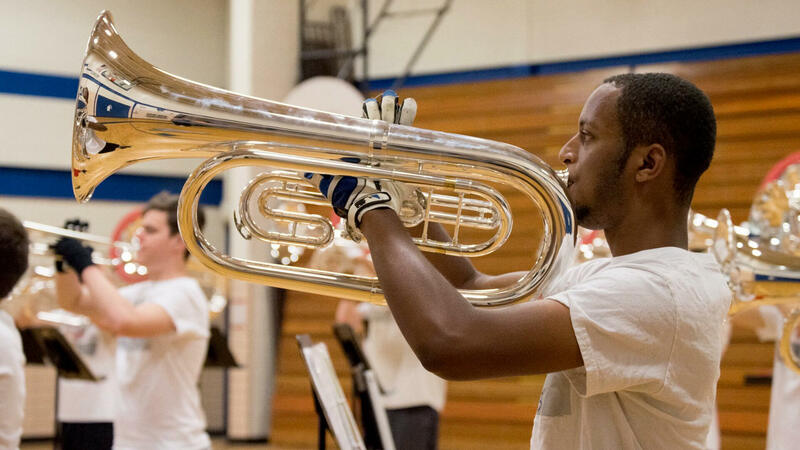 Phantom Regiment posted a large photo gallery from the corps’ recent brass-only rehearsal camp. River City Rhythm performers share their thoughts on why others should join them for the corps’ 2017 season in the recently-posted “Members Speak, Volume 2” video. Volunteers are needed for the organization’s Vanguard Hall and Fleet Day event on April 22. Helpers will assist in washing vehicles, painting, storage organization, and other tasks. Free lunch will be provided. There are just a few Seattle Cascades color guard positions still to be filled. Interested prospective members should email the corps for additional information. Spirit of Atlanta will have auditions for its remaining open color guard spots April 28-30 in Locust Grove, Georgia. Did you know Troopers has a bingo operation? It’s where all the cool cats (literally!) go to play. The Vanguard Cadets horn line joined the horn line of Santa Clara Vanguard for a performance at the corps’ annual birthday celebration. Enjoy this video that caught the excitement of the moment. After a three-month audition process, Watchmen has announced the three individuals who will serve as the corps’ 2017 drum majors.